To Cite: Alkhafaji B, Younis M U, Alkhafaji Y. Laparoscopic Repair of Perforated Marginal Ulcer After Roux-en-Y Gastric Bypass: A Case Report and Review of Literature, J Minim Invasive Surg Sci. 2018 ; 7(3-4):e84181. doi: 10.5812/minsurgery.84181. Introduction: A possible complication that may present late after Roux-en-Y gastric bypass is the development of marginal ulcer at the gastrojejunostomy site. 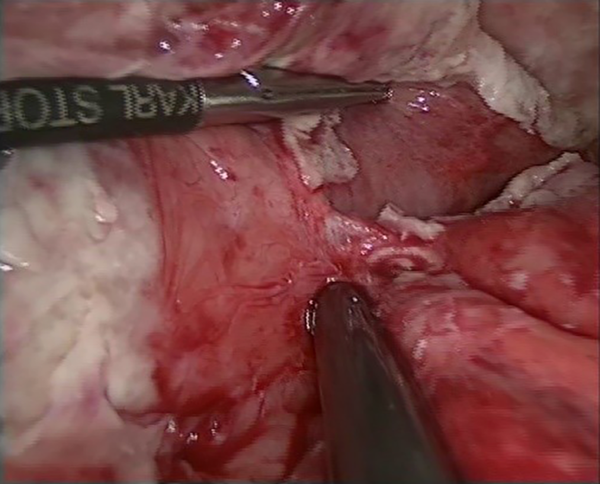 We discuss here an emergency presentation of a case with a delayed perforation at the anastomosis 5 months after surgery which dealt successfully with the laparoscopic approach. Case Presentation: A 45-year-old female presented to the emergency department for evaluation of severe upper abdominal pain. Her past history was significant for laparoscopic Roux-en-Y gastric bypass surgery for weight loss done in Oct 2016 and further denied any history of chronic medication, alcoholism, smoking or any co-morbidity. She was examined and found to have a tenderness all over the abdomen with sluggish bowel sounds and decreased air entry at bases bilaterally, more so on the left side. Portable CXR revealed air under the diaphragm and an obliterated left costophrenic angle. A repeat CT scan with gastrograffin contrast was carried out and findings confirmed a perforation at the site of gastrojejunal anastomosis with free fluid in the pelvis and flanks. She underwent laparoscopic exploration and repair of anastomotic perforation with omental patch and was discharged in a healthy fashion on her 7th postoperative day. Conclusions: This case report corroborates with literature available from many sources that marginal ulcer perforation is one of the serious complications after Roux-en-Y gastric bypass and may present early in the first few months or as a delayed entity years after the surgery. Once diagnosed, urgent intervention is required and laparoscopic repair has shown itself a safe and effective treatment strategy where facilities are available. Copyright © 2019, Journal of Minimally Invasive Surgical Sciences. This is an open-access article distributed under the terms of the Creative Commons Attribution-NonCommercial 4.0 International License (http://creativecommons.org/licenses/by-nc/4.0/) which permits copy and redistribute the material just in noncommercial usages, provided the original work is properly cited. Morbid obesity is a major health concern worldwide and bariatric surgery is considered as an impressive treatment strategy for tenable weight loss and reduction of comorbidities associated with it (1). Among the bariatric surgical procedures, Roux-en-Y gastric bypass is hailed as the gold standard and is the most commonly performed operation (2), because of its effectiveness in maintaining long-term weight reduction goals and management of obesity-related diseases (3). In spite of achieving tremendous results (4), it is still fraught with complications that require vigilance for early detection and management. A potentially ominous complication that may present late after the bypass is the development of a marginal ulcer at the gastrojejunostomy site which may further perforate and present with peritonitis. 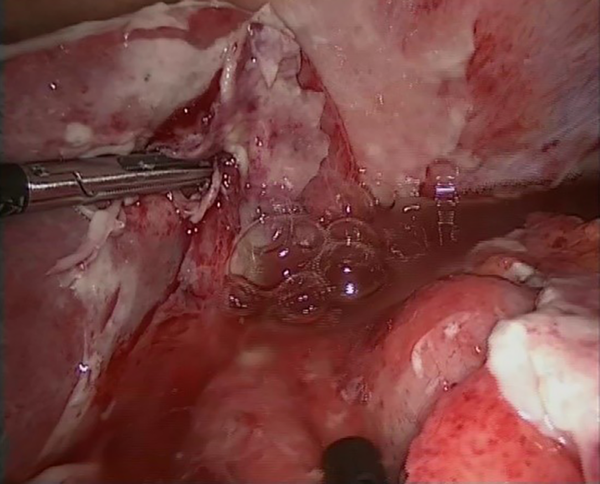 We discuss here an emergency presentation of a case with a delayed perforation at the anastomosis (5) months after surgery which was dealt successfully with the laparoscopic approach. A 45-year-old healthcare facility worker with no known comorbidities was shifted from Nepal via Air Ambulance to the emergency department of our institution for the evaluation of severe upper abdominal pain. The patient described a sudden onset of excruciating upper and left flank pain 3 days back while she was in Nepal for which she was taken to a local facility where she underwent treatment with analgesics; then CT scan was arranged which reported free air in the peritoneal cavity. Her past history was significant for laparoscopic Roux-en-Y gastric bypass surgery for weight loss done in Oct 2016 and further denied any history of chronic medication, alcoholism or smoking. A suspicion of peptic ulcer perforation was entertained and conservative management started with IV fluids and IV antibiotics. Subsequently, her condition worsened and WBC count increased to 20,000 × 109/L and patient was shifted to another local facility, where the decision was taken to proceed with surgery but the patient wished to be transferred to our hospital for management. On arrival, she was examined and found to have a tenderness all over the abdomen with sluggish bowel sounds and decreased air entry at bases bilaterally more so on the left side. Portable CXR revealed air under the diaphragm and an obliterated left costophrenic angle. A repeat CT scan with gastrograffin contrast was carried out as the patient was hemodynamically stable and findings confirmed a perforation at the site of gastrojejunal anastomosis with free fluid in the pelvis and flanks. She was prepared for laparoscopic exploration and repair of anastomotic perforation with omental patch and resuscitation started with IV fluids and broad-spectrum antibiotics. Under complete aseptic technique, Veress needle CO2 insufflation was carried out to achieve a pneumoperitoneum at 17 mmHg via a supra umbilical incision which was used as camera entry point as well and further three working ports were inserted under vision as follows: 10 mm in the right midclavicular line, 5 mm in the left midclavicular and another 5 mm in the epigastrium at appropriate triangulation distances from one another. Exploration confirmed peritonitis with around 200 cc of pus collected in the right and left hypochondrium and pelvis (Figure 1). Pus sample was collected for culture and sensitivity and aspiration was carried out. Fibrinous adhesions discovered around the anastomotic staple line which had to be cautiously separated to expose the perforation (Figure 2) and confirmed by pushing air through the nasogastric tube and observing bubbling in the water instilled around the leak (Figure 3). The closure was carried out transversely using an absorbable suture (Figure 4) and reinforced by an omental patch. Copious irrigation of the peritoneal cavity was carried out with normal saline. Drains were placed in the pelvis and around the anastomotic bed and patient was shifted to HDU for routine postoperative care. A Left Intercostal tube inserted 3 days post op for left pleural effusion which drained 475 mL of turbid fluid and was removed the next day. An ultrasound abdomen did 4 days after intervention showed no significant collections, and her post-op course stayed satisfactory until her discharge on the 7th day. She remained healthy and symptom-free on immediate follow-up visits before flying back to her home country and a follow-up gastroscopy done 10 months after surgery showed normal integrity and patency of the anastomosis and repair. Roux-en-Y gastric bypass is hailed as the gold standard procedure in bariatric surgery and is the most commonly performed operation because of its effectiveness in maintaining long-term weight reduction goals and management of obesity-related diseases. The development of an anastomotic or marginal ulcer is an acknowledged late complication of Roux-en-Y gastric bypass surgery which usually complicates the jejunal side of the anastomosis with rates described between 0.6% - 16% (5, 6) in different studies. The incidence of perforated ulcers, however, has been cited at 0.4% - 1% (7). Various causes implicated in the pathogenesis of these ulcers are discussed by Steinemann et al. (8) in their international survey and can be divided into surgical and non-surgical risk factors, for analytical purposes. Surgical factors include mucosal ischemia, tension at the anastomosis, larger gastric pouch with more gastrin-producing cells, staple line disruption and use of non-absorbable suture for staple line reinforcement (9). Non-surgical factors which may need to be addressed are smoking, diabetes mellitus, NSAID use, corticosteroids, and persistent H.Pylori infection (10). Patients usually present with symptoms of pyrosis, dysphagia, and nausea which are more often than not dismissed as common postoperative complaints of overeating. The evolution of marginal ulcers entails a strong association between local factors like ischemia, stenosis or foreign body with early ulcers while an increased acid exposure at the anastomotic site is a more likely basis for a late presentation (11). The fundamental course of management would include continuation of therapy with a proton pump inhibitor for 3 - 6 months, eradicate the likely risk factors involved and monitor healing with endoscopic control (11). Notwithstanding, an acute presentation with a perforated marginal ulcer is a serious and lethal complication that needs to be dealt with promptly. We have talked about such a patient in our report who was diagnosed with a perforated marginal ulcer 5 months postoperatively for which we performed a repair of the perforation laparoscopically and instituted an omental patch reinforcement. Felix et al. have put forward their analysis and have recognized 35 cases of perforation post bypass with a median time to perforation of 18 months (range of 3 - 70 months) incriminating smoking, NSAID use, and steroids as a viable causes (12). The most delayed onset of perforation discussed in the literature is found to be 98 months after the initial surgery (7). Due to the rarity of such a complication, there is no general agreement regarding the ideal therapy for such patients. 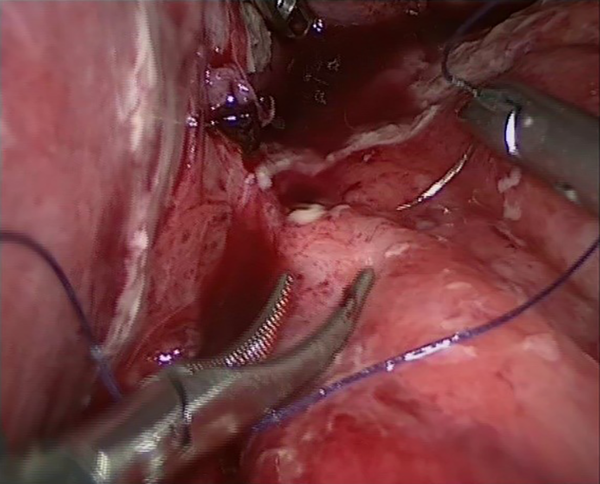 However, various sources have detailed a laparoscopic technique with repair and omental patch placement and have found it to be a feasible and safe option (7, 13), provided the expertise to carry out a minimally invasive approach is available and the attending surgeon is familiar with the nuances of bariatric surgical procedures. The advantages of a keyhole procedure also result in a shorter hospital stay, less postoperative pain and earlier return to normal activities. Marginal Ulcer perforation is one of the serious complications after Roux-en-Y gastric bypass and may present early in the first few months or as a delayed entity years after the surgery. A low threshold should be entertained for diagnosis and management of complications of surgery. We recommend undertaking the laparoscopic approach as per our experience with this case and also advocate preoperative counseling of the patient undergoing bariatric surgery to identify and curtail risk factors so that complications can be minimized. Conflict of Interests: The authors declare no financial or non-financial competing interests. Ethical Consideration: Informed consent was taken from the patient for this publication. 1. Suter M, Giusti V. [Bariatric surgery in 2013: principles, advantages and disadvantages of the available procedures]. Rev Med Suisse. 2013;9(379):658. 660-3. French. [PubMed: 23596739]. 2. DeMaria EJ, Pate V, Warthen M, Winegar DA. Baseline data from American Society for Metabolic and Bariatric Surgery-designated Bariatric Surgery Centers of excellence using the bariatric outcomes longitudinal database. Surg Obes Relat Dis. 2010;6(4):347-55. doi: 10.1016/j.soard.2009.11.015. [PubMed: 20176512]. 3. Hutter MM, Schirmer BD, Jones DB, Ko CY, Cohen ME, Merkow RP, et al. First report from the American College of Surgeons Bariatric Surgery Center Network: Laparoscopic sleeve gastrectomy has morbidity and effectiveness positioned between the band and the bypass. Ann Surg. 2011;254(3):410-20. discussion 420-2. doi: 10.1097/SLA.0b013e31822c9dac. [PubMed: 21865942]. [PubMed Central: PMC3339264]. 4. Ali MR, Fuller WD, Choi MP, Wolfe BM. Bariatric surgical outcomes. Surg Clin North Am. 2005;85(4):835-52. vii. doi: 10.1016/j.suc.2005.03.005. [PubMed: 16061089]. 5. Rasmussen JJ, Fuller W, Ali MR. Marginal ulceration after laparoscopic gastric bypass: An analysis of predisposing factors in 260 patients. Surg Endosc. 2007;21(7):1090-4. doi: 10.1007/s00464-007-9285-x. [PubMed: 17514403]. 6. Dallal RM, Bailey LA. Ulcer disease after gastric bypass surgery. Surg Obes Relat Dis. 2006;2(4):455-9. doi: 10.1016/j.soard.2006.03.004. [PubMed: 16925380]. 7. Wendling MR, Linn JG, Keplinger KM, Mikami DJ, Perry KA, Melvin WS, et al. Omental patch repair effectively treats perforated marginal ulcer following Roux-en-Y gastric bypass. Surg Endosc. 2013;27(2):384-9. doi: 10.1007/s00464-012-2492-0. [PubMed: 22936436]. 8. Steinemann DC, Bueter M, Schiesser M, Amygdalos I, Clavien PA, Nocito A. Management of anastomotic ulcers after Roux-en-Y gastric bypass: results of an international survey. Obes Surg. 2014;24(5):741-6. doi: 10.1007/s11695-013-1152-3. [PubMed: 24347350]. 9. Vasquez JC, Wayne Overby D, Farrell TM. Fewer gastrojejunostomy strictures and marginal ulcers with absorbable suture. Surg Endosc. 2009;23(9):2011-5. doi: 10.1007/s00464-008-0220-6. [PubMed: 19067070]. 10. Azagury DE, Abu Dayyeh BK, Greenwalt IT, Thompson CC. Marginal ulceration after Roux-en-Y gastric bypass surgery: Characteristics, risk factors, treatment, and outcomes. Endoscopy. 2011;43(11):950-4. doi: 10.1055/s-0030-1256951. [PubMed: 21997722]. 11. Csendes A, Torres J, Burgos AM. Late marginal ulcers after gastric bypass for morbid obesity. Clinical and endoscopic findings and response to treatment. Obes Surg. 2011;21(9):1319-22. doi: 10.1007/s11695-011-0429-7. [PubMed: 21725715]. 12. Felix EL, Kettelle J, Mobley E, Swartz D. Perforated marginal ulcers after laparoscopic gastric bypass. Surg Endosc. 2008;22(10):2128-32. doi: 10.1007/s00464-008-9996-7. [PubMed: 18553197]. 13. Wheeler AA, de la Torre RA, Fearing NM. Laparoscopic repair of perforated marginal ulcer following Roux-en-Y gastric bypass: a case series. J Laparoendosc Adv Surg Tech A. 2011;21(1):57-60. doi: 10.1089/lap.2010.0402. [PubMed: 21247305].